Are there vaccines against fleas, ticks, lice, mites, flies, worms, etc.? Many people search in the web for information on "tick vaccines", "flea vaccines", "lice vaccines", etc. They have heard about veterinary products that are administered periodically, e.g. once a month, and keep dogs, cats or livestock free of such parasites. There are several products that are administered once a month and keep pets or livestock free of many parasites. However, they are not true vaccines but highly efficient classic chemical pesticides. Most of them are available as spot-ons (=pipettes, drop-ons, squeeze-ons) or tablets. There are true vaccines against some external and internal parasites, but very very few: only against Rhipicephalus (=Boophilus) ticks for cattle, against Echinococcus granulosus (hydatidosis, echinococcosis) for cattle, sheep, goats and camelids, and against Dictyocaulus spp (lungworms) for cattle and sheep. There are no true vaccines against external or internal parasites for pets. A vaccine is a medicine that usually contains antigens of a living organism, mostly a microorganism (e.g. bacteria, viruses, etc.) that is pathogenic for humans or animals (or both). These antigens are administered to the animal that needs protection in order to stimulate its own immune system to produce antibodies against those antigens and this way fight the harmful intruders. In a few cases, the vaccine does not contain antigens, but already antibodies against the harmful intruder. Both antigens and antibodies are mostly very complex proteins that can only be produced by living organisms. This means that they are not at all synthetic chemicals as the vast majority of pesticides and parasiticides. Numerous human and animal diseases are due to intruding microorganisms such as bacteria and viruses. There are vaccines against many of these microorganisms: e.g. against smallpox, cholera, rabies, tetanus, encephalitis, influenza, etc. Viruses and bacteria are rather simple organisms and it is technically quite easy to produce vaccines against many of them. In fact, >99% of all vaccines available today are against such organisms. However, ticks, fleas, mites, lice, flies, worms and other parasites are multicellular organisms substantially more complex than viruses and bacteria. And it is much more difficult to produce vaccines against them. One of the reasons is that they have found ways to fool the immune system of their host. As already said, there are so far no true vaccines against such parasites for humans or pets, and only very few for livestock. A lot of research has been carried out in the last decades on the development of vaccines against external and internal parasites of livestock and pets. Some of those parasites have features that make them theoretically suitable for being controlled through vaccines (and it would be a tremendous business...). This is the case for all those parasites that remain in close contact with the host during a long period of time, and therefore are exposed to the host's immune system. Many parasites are inside the host (e.g. all parasitic worms, cattle grubs, botfly maggots, mites, etc.) others are on the host's surface, either sucking blood (e.g. fleas, ticks, etc.) or feeding on injuries (e.g. screwworm and blowfly maggots), etc. All these vaccines against parasites have in common that they are not as effective and reliable as most chemical pesticides or medicines used for their control, or as other classic vaccines against microorganisms. And the immune response of each vaccinated animal depends strongly on its individual characteristics and on its health and fitness when vaccinated. In sick, hungry, young or old animals the immune response after vaccination may be insufficient to protect them effectively against the concerned parasite. Another weakness of all vaccines is that they are very species-specific, i.e. they work only against one parasite. But very often livestock and pets need to be protected against various parasite species at the same time. E.g., in many countries cattle are not only affected by Boophilus ticks, but by other tick species as well. If they are vaccinated against Boophilus ticks, it will be probably necessary to continue using tickicides against other tick species. 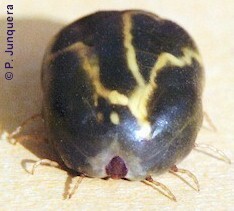 All ticks remain many days and even weeks attached to their hosts and sucking their blood. While feeding they inject their saliva into the host's organism. This saliva contains several antigenic components. These antigens are detected by the host's immune system that reacts producing the corresponding antibodies, which are ingested by the tick with the host's blood. However, it is known that the saliva of ticks (and of many other blood sucking parasites) also contains susbtances that reduce the immune response of the host. As a consequence, even if the host's immune system reacts to the intruding antigens, the response is often insufficient or not quick enough to completely protect the host from ticks. Some ticks may be killed, but not all. And those that are killed may be killed only very slowly. The bottom line is that cattle develop some immunity against ticks and this will reduce the infestation level to some extent, but they will remain infected. All current commercial vaccines against R. microplus ticks are based on the so-called hidden recombinant Bm86 antigen, which is a specific polypeptide (i.e. a chain of amino acids, smaller than a protein) from the tick's gut. The tick vaccine contains this Bm86 antigen. When injected to cattle, their immune system recognizes Bm86 as an intruder and produces antibodies against it. When ticks feed blood on vaccinated cattle, this blood will contain these antibodies, which reach the ticks' gut, bind to the Bm86 polypeptide in the gut cells and slowly destroy these cells. Affected ticks cannot digest the blood and will eventually die. Some ticks die directly on the host and other ticks will detach and die on the ground, before or after oviposition. If a whole cattle herd within a farm is vaccinated, the tick population in the farm will be slowly decimated. As a general rule several years are required for reducing the tick population below the economic threshold level. In the meantime acaricidal treatments must be continued but with a decreasing frequency. It is important to understand what it means that the Bm86 antigen is a hidden antigen. It means that it is not naturally introduced into the host's organism with the tick's saliva, since it is a polipetide from the gut cells of the tick. As a consequence, the natural tick bite does not induce the host's immune system to produce antibodies against Bm86. Therefore the effect of this vaccine will last only as long as there are enough Bm86 antigens circulating in the host's blood. Since they are progressively used, and the Bm86 antigen is not re-introduced with the tick bites, it is necessary to re-vaccinate cattle periodically (i.e. to reintroduce the Bm86 antigen to stimulate the production of the corresponding antibodies). This is in contrast with most other classic vaccines, which can provide immunity for many years and even for the whole life. The Bm86 antigen is called recombinant because it is not obtained directly from ticks, but from special bacteria that have been genetically engineered to contain the gene that codes for Bm86 and allow its mass-production. The vaccine against Rhipicephalus microplus works also against Rhipicephalus decoloratus, the tropical cattle tick. Additional information on this vaccine is available in the article on Boophilus ticks in this site. So far there are no other commercial vaccines against other tick species that affect cattle. And there are no true tick vaccines at all for other livestock, dogs or cats. As already mentioned, many people refer to vaccines when talking about pesticides or medicines (spot-ons, tablets, etc.) that are periodically administered. Click here to learn more about these untrue vaccines. The increasing problems caused by the red fowl mite (Dermanyssus gallinae) in layers woldwide, mainly due to resistance, has pushed research on vaccines against these mites. These mites are obligate blood-suckers, very much like cattle ticks, and all development stages feed on their hosts. This means that they spend a lot of time on their hosts (in layer hens typically during the night). For this reason a similar approach as the one used against cattle ticks previously explained has been followed for finding a vaccine, i.e. to use "recombinant hidden antigens". Progress is modest so far. Field trials with a vaccine containing natural mite extracts achieved up to 78% control of the mites. But when a cocktail of recombinant hidden antigens was used, no control was achieved. A vaccine based on natural mite extracts is commercially not viable because ensuring standardization and reliable specifications would be very difficult and production too expensive. This means that research will continue, probably for decades, until significant progress allows introducing a commercial vaccine. As described in the specific article on cattle grubs, Hypoderma flies deposit eggs on cattle and other hosts. The hatching larvae get inside the host's body where they remain for months exposed to the host's immune system during their long migration across the host's organism. It is known that cattle that have been exposed to cattle grubs develop a significant degree of natural immunity. It was reasonable to believe that such immunity could be obtained with an adequate vaccine. Research found out that young L1-larvae are especially sensitive to an immune response. These larvae produce a series of proteins called hypodermines that are associated with the digestion of the host's tissues during larval migration. Such proteins are adequate for producing antibodies. Experimental vaccinations achieved up to 90% protection. Hypodermine A was identified as the most promising antigen. It was sequenced, cloned and produced in E. coli bacteria using a technology developed by the USDA-ARS in cooperation with a private company. The technology was further licensed to another company for development and marketing. In the meantime all the hypodermines have been sequenced. In fact, it is the most advanced vaccine against an external parasite of livestock after the previously mentioned Boophilus vaccine. Nevertheless, no commercial vaccine has been introduced so far. Maybe because cattle grub control has become very easy and economic with the arrival of generic macrocyclic lactones. (e.g. ivermectin, doramectin, etc.). Female Lucilia spp flies deposit their eggs on sheep wool and the emerging larvae crawl down to the host's skin where they start feeding on the body tissues. They soon produce so-called cutaneous myiasis, i.e. injuries where the maggots congregate for feeding on the host tissues. Such wounds increase quickly in size and left untreated can be fatal for sheep within a few days. Feeding larvae remain in contact with the host's tissues and therefore exposed to its immune system for several days until they mature and drop to the ground for pupation. Using antibodies to so-called peritrophines (a family of proteins found in the peritrophic membrane of the larval gut) their functionality could be experimentally impaired, which led to starvation of the larvae: they were unable to feed properly. As ticks and many other parasites, blowfly larvae produce molecules that reduce or suppress the immune reaction of affected sheep. Such a molecule has been recently identified and research continues also on how to block this immunosuppressive agent. This would allow the sheep's own immune system to defend itself against the parasitic larvae. However, no commercial vaccine or related product has reached the market so far. These mites spend their whole life in the skin of the same host, mostly sheep and cattle. Research has been carried out using several antigens, obtained either from more or less purified mite extracts, or from serum of immunized animals. However related studies on sheep and cattle have not gone beyond the stage on in vivo trials on a few animals, and the results have not been very promising so far. Research continues in order to identify more appropriate antigens. 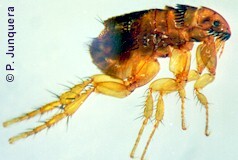 Adult fleas spend their whole life on the surface of their host and feed blood regularly. During each blood meal they are exposed to the immune system of the host and theoretically the host should show some immune reaction. Consequently research on tick vaccines has concentrated on the adult fleas, not on the larvae, which complete their development off the host. Following the same approach as against Boophilus ticks, research was carried out using hidden antigens fron the flea gut. Experimental vaccination of rabbits and dogs with antibodies against such antigens reached control levels of about 25% (i.e. absolutely not enough), as well as a reduction in the amount of viable eggs deposited by affected fleas. Further progress has been very modest. The bottom line is, that no true flea vaccine has reached the market so far: Neither for dogs or cats, nor for livestock. Instead, numerous very potent and convenient flea control products for pets have flooded the market in the last decades. It would be very difficult for a less effective flea vaccine to compete with such products. You can find additional information on flea control on dogs and cats or on livestock in this site. Considerable research has been carried out in order to immunize livestock or pets against many other external bloodsucking parasites (e.g. horn flies and mosquitoes), or against various myiases (e.g. sheep nasal bot flies). But most studies have not gone beyond a very preliminary stage: observing the immune response of the affected hosts, identifying potential antigens, etc. Investigations on potential vaccines against parasitic helminths are numberless, especially against the most harmful species for livestock (e.g. gastrointestinal roundworms such as Haemonchus spp, Dictyocaulus spp and Ostertagia spp; flukes such as Fasciola hepatica, tapeworms such as Echinococcus granulosus) or pets (e.g. Dirofilaria spp). Practical results so far are disappointing. In fact the only commercial vaccines available in some countries are those against Dictyocaulus viviparus for cattle, against Dictyocaulus filaria for sheep, and against Echinococcus granulosus for ruminants. There are no commercial vaccines at all against parasitic worms of dogs and cats. 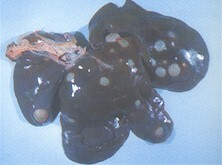 Vaccines against Dictyocaulus viviparus (cattle lungworms) and Dictyocaulus filaria (sheep lungworms) contain irradiated larvae of the parasite. After irradiation the larvae are not pathogenic but nevertheless induce an immune response that makes vaccinated calves or lambs quite immune to worm infestations. However, efficacy is not completely reliable and vaccinated animals can pass larvae to the feces that are infective and pathogenic for non-vaccinated animals. This approach has been tried for other worm species (e.g. Haemonchus spp), as well as other technologies based on recombinant or natural hidden antigens. Unfortunately it has not resulted so far in other practical solutions for farmers. A basic problem for all vaccines against gastrointestinal roundworms of livestock is that infestations are mostly mixed, i.e. several worm species infest the animals simultaneously (e.g. Haemonchus spp, Trichostrongylus spp., Cooperia spp, Ostertagia spp, etc.). Controlling one species with a vaccine would not solve the whole problem: anthelmintic treatments would be still required for controlling the other worm species. The recent introduction in Argentina of a vaccine against Echinococcus granulosus (PROVIDEAN HIDATIL EG 95 ®, from TECNOVAX) for cattle, sheep, goats and South American camelids shows that it is nevertheless possible to develop successful vaccines against parasitic worms. This vaccine is based on the recombinant EG95 antigen obtained from worm eggs. EG95 is a protein secreted by the parasite's oncospheres, the larval stage that infects intermediate hosts. EG95 is associated with cell adhesion and is thought to be essential for allowing the oncospheres to cross the gut wall of their hosts and to reach their target organs along the blood and lymph vessels. One dose provides up to 82% protection, two doses up to 97%, and 3 doses up to 100%. For the time being this vaccine is not suited for protecting other livestock (horses, pigs), dogs or cats. The technology required for developing vaccines against such complex organisms as arthropod and helminth parasites often exceeds the capacity of most small and medium-sized laboratories involved in research and production of vaccines against bacteria, viruses and other microorganisms. As a consequence most research on parasite vaccines is and was conducted by universities and/or governmental research institutions. If ever there is a breakthrough, such institutions need a commercial partner that a) transforms a laboratory technology in an attractive industrial product, and b) sells it successfully. This may explain why there are still so few parasite vaccines in the market. Large Animal Health multinational companies invested a lot in research on parasite vaccines in the past. However they have vastly given up this battlefield in the last decades, perhaps frustrated by the slowness of progress, by the exploding costs, or by both. In addition, it is more difficult to get patent protection for vaccines than for classic chemicals. It is also a matter of fact, that most Animal Health multinationals have concentrated their investments in the small animal business, and substantially reduced their efforts on livestock, where the need for such vaccines is stronger. It is unlikely that they change their strategy in the coming years. These parasites are much more complex than bacteria and viruses, and have been naturally selected during houndreds of thousands of years for fooling the host's immune system. This makes vaccine development extremely difficult and investments in this field are quite risky and unpredictable. This will not encourage Animal Health multinationals to invest a lot in this market. Current vaccines often have a "disappointing efficacy" when compared with the high efficacy of many chemical parasiticides. This is the case e.g. for the Boophilus tick vaccine. As a consequence many farmers are disappointed after a try: they are used to see thousands of ticks falling dead after dipping or spraying their cattle with a tickicide, something that will not happen with the tick vaccine. If ever vaccines against fleas, flies, mites, other ticks, etc. are developed, they are likely to encounter the same problem. By definition vaccines are species-specific: they will control only one parasite, whereas most livestock and pets need simultaneous protection against several parasites. If one parasite is controlled by a vaccine, all other concomitant parasites will still require to be treated with conventional pesticides or medicines. This means that the benefit for most farmers and pet owners will be quite modest, if at all. For these reasons, excepting a few very large markets (fleas, heatworms, liver flukes, etc. ), parasite vaccines are likely to be small niche products, which makes them unattractive for most Animal Health companies. The same mechanisms that cause the appearance of parasite resistance to chemical parasiticides can cause resistance to vaccines, especially if they should be used as massively as many parasiticides.